The desire to have ideal weight makes a lot of people to undergo certain diet tips. Often feel guilty even when tempted to eat "forbidden” foods or feel hunger at night for fear of fat. Actually you can still fulfill the desire to have the ideal body shape with the right diet. Just make sure your diet is smart and right, don't follow a bad dietary advice, including these 10 worst mistake. Not all fats are harmful or dangerous, depending on the type of fat. According to nutrition expert based in Washington DC, Tricia Psota, RD, fat choice determines your healthy diet. “Fat in the chips, pastries, greasy foods can increase cholesterol levels and increase the risk of disease. But good fats like nuts, avocados and salom, protect your heart and nourish the body, “ She said. Sharon Palmer, RD, author of The Plant-Powered Diet adds good fats are included in a healthy diet menu actually helps you keep the weight off. 2. Stop snacking if you want to be thin. These suggestions should not be followed. Instead, eat small meals more frequently, can overcome hunger that drives you to eat more. Mike Clansy, CDN, personal trainer at David Barton 's Gym in New York suggested besides eat frequently in small portions , you also need to control the portion sizes of food and watched the nutrients from food. “More intelligent choosing snacks such as nuts, fruit, yogurt to maintain energy all day, " he advised. Clancy proving, program design diet, which suggests the main meal plus snacks 3-4 times, it can lose weight up to five pounds in two weeks. Clancy said, calories are important for controlling food portions, but not the only factor that determines the nutrients from your food. So, the focus is not calculating how calories from your diet. Because it could be, the food you eat fewer calories but no nutritional value. “Calories are different. Vary the type, time consuming calories is also different, the quality and the effect of calories to the body also have significant differences. Foods have different reactions in the body, and the type of food that you eat is an important component in the diet, “said Clansy. For example, an apple of 50 calories is the same as cheese cake. But when eaten, the effect of two same -calorie foods will be different on your body. Quality of calories is also important to note, not just the numbers. Calories in spinach, for example, have more nutrients than calories in fries that do not have any nutrients. This suggestion is often encountered in the diet tips. The truth is, still eat carbs but choose the kind that is rich in nutrients such as carbohydrates in the grain or fruit. “It is true, the intake of carbohydrates such as white bread, white rice, can add weight or increase cardiovascular risk. But no research showing that healthy carbohydrates such as whole grain , fruits , vegetables have a negative impact on health or weight loss , " said Chrissy Carroll , MPH , RD , founder of Inspired Wellness Solutions, LLC . Rania Batayneh, MPH, a nutritionist and author of The One One One Diet, says eating more protein is not the key to losing weight. The body needs three main macronutrients such as proteins, carbohydrates, and fats. So, focus on eating protein to lose weight is an absurd way. Palmer said there is no scientific evidence that suggests that gluten is a food ingredient the cause of obesity. MaryAnne Metzak, CDN, nutritionist in Southampton, New York said just by eliminating gluten intake without consulting a doctor could lead to deficiencies of essential nutrients such as fiber, iron, vitamin B12 and magnesium. 7. Burn more calories if you exercise on an empty stomach. In fact, exercising on an empty stomach or charged, has nothing to do with burning calories. Even so, should the contents of the stomach with a natural sweetness of the fruit, such as bananas, peaches, mango before exercising. Or choose chocolate instead of tea or coffee before exercise. “Chocolate contains a substance that makes the body feel better called neurotransmitters, like substance released when you run, “said Sanda Moldovan, DDS, MS, CNS, diplomat of the American Academy of Periodontology. 8. Eat every two hours to restore metabolism. 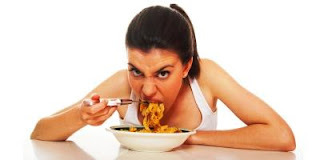 “Eating more frequently can indeed overcome hunger, and help you to not be tempted to eat. But if you want to do this, you should be more careful in choosing the food, select the main and light meals in small portions, “says Monica Reinagel, MS, a nutritionist in Baltimore. Reinagel said, eating every two hours will lead to increased calorie intake per day. 9. Controlled meals on weekdays, a free meal at the weekend. Uncontrolled eating on the weekends will make your diet success throughout the week to be collapsing in vain. “On weekends, our tendency is to sleep, do not exercise, drink and eat more. So if you managed to lose weight on a weekday, you can easily gain weight at the weekend. So, you should keep weight on once the weekend also, “ Batayneh suggests. So, if you are trying to lose weight, you should keep the food on the weekends, not necessarily free to eat anything because it was already struggling on weekdays. “We tend to avoid various types of foods while dieting. Granted you cannot eat pizza, fries, and a chocolate cake in a day. But actually you can still enjoy this meal with good planning, and more carefully choose food, “said Batayneh. According to Batayneh, just indulge in moderation with “forbidden“ food can make you avoid the temptation of taking them out of control. Amazing health tips for weight loss.